For the past few weeks, I've been devoring the last of the summer's bounty: peaches. When the peaches (and corn) are done, summer's ov-ah. It helps that the tree-ripened peaches I've been getting at the market are superbly juicy and sweet within a day or two. There have definitely been a few perfect ones in the mix. 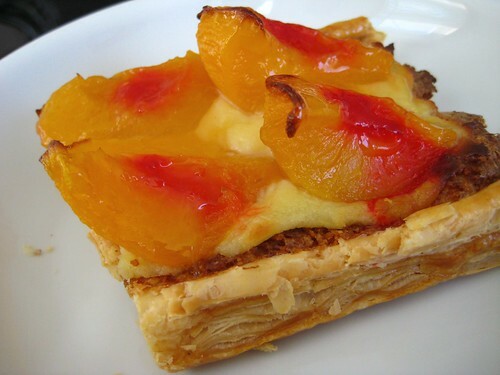 And yet for some reason seeing peaches incorporated into delicious desserts aren't commonplace, so you can understand my excitement when I spied peach tart slices at Cookie Road! Cookie Road is not just specialty hand painted cookies, though those do look good and if anyone would like to send me a set I wouldn't be adverse to it. No, Cookie Road is also a coffee shop/bakery. I was stopping by to try out their Iced Americano when I spotted the tray of flaky pastry topped with peaches and cream! Though the tart is most likely eons better when fresh, the late afternoon snack was way above average. Having a tart on light flaky pastry is an excellent idea for a summer treat, and the cream is the right complement especially as a means to pick up all the flakes. But what I liked most of all was the minimalist glaze on top of the juicy peaches. 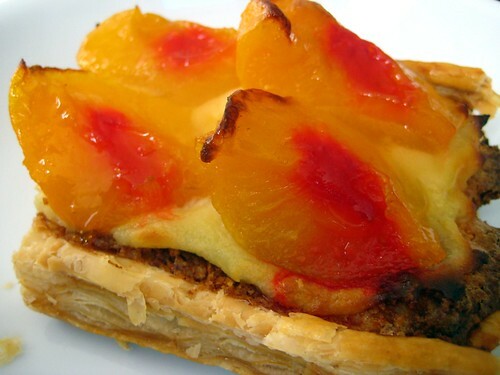 Unless a fruit tart is homemade, chances are it will be topped with glaze to keep the fruit from drying out. I don't mind it unless it's a thick layer of goop, and most times it's a thick layer of goop. This glaze was minimal, you notice it, but it doesn't take away from the fruit nor do you want to peel it off to enjoy your dessert. With that accomplishment, Cookie Road is now high on my Greenpoint list! Yum, those peaches look scrumptious!